Hicham Hraid-Rochette worked in the famous restaurants of Les Frères Pourcel as Manager of their different places in France and abroad. 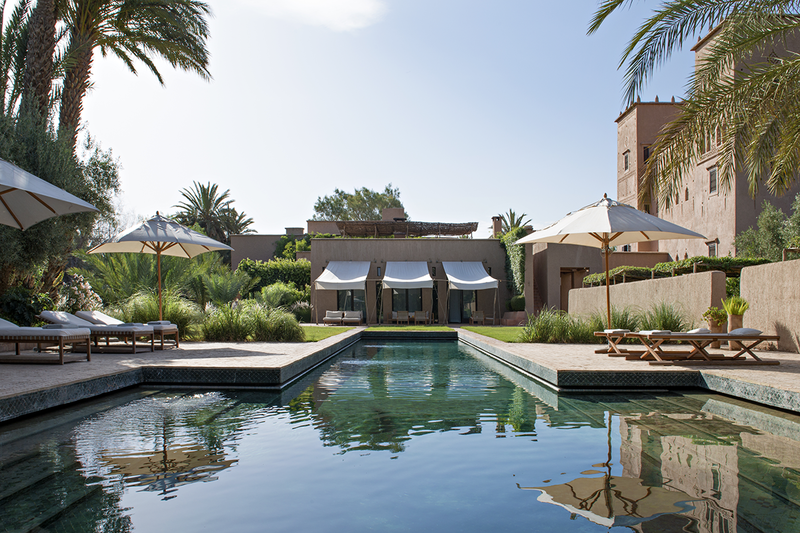 In 2007, he joined Ksar Char Bagh as general manager, one of the Relais & Chateaux in Morocco. And he has been our Manager for Moroccan operations since 2009. To offer to our clients a complete, unique and very different experience by organising meals privately everytime in a different place and decor: no constraint of place and time. 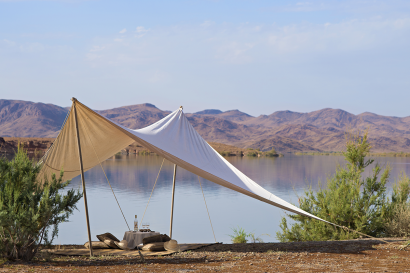 And by organising also privately exceptional excursions & activities such as a night in the desert, a massage in the garden, a movie under the stars… The simplicity of pure experience with the standards of excellence. 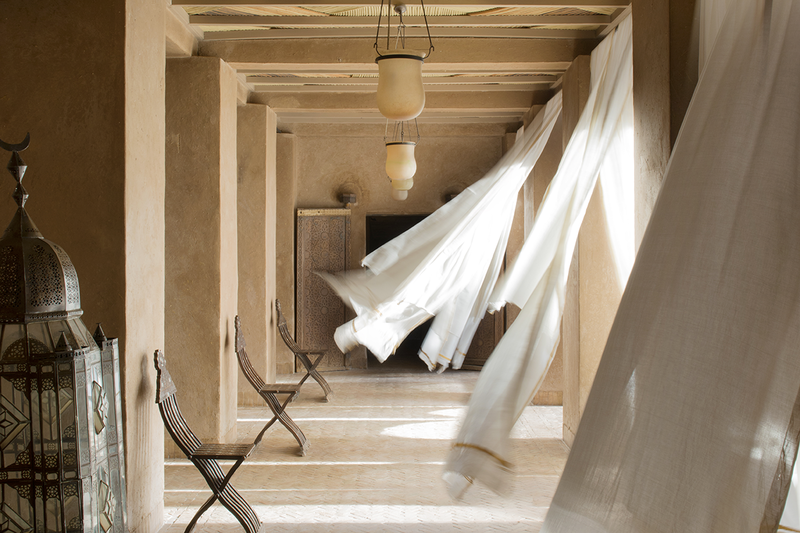 Dar Ahlam was created in 2002 by Thierry Teyssier. It reflects perfectly Thierry’s passion, which is theatre: surprises, new settings, magical moments and, enchanted pauses. It is a complete new way to imagine an hotel, named a House of Dreams. Not one stay looks like another one. We change decor in winter and in the summer so the colours and the fabrics fit perfectly the season. 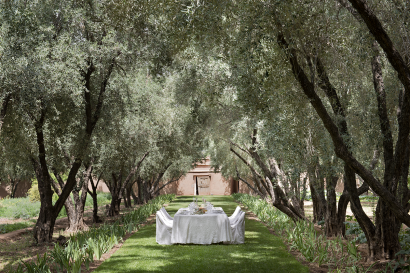 We will take you in the Valley of Almond trees in February, while we will take you in the Valley of Roses in April when the roses are blooming. We organise made to measure stay for each client, each time it is a new story. Each year, we close a month during the summer to do renewing, construction and paintings. In 2012, 2 villas were turned into 4 superior suites. 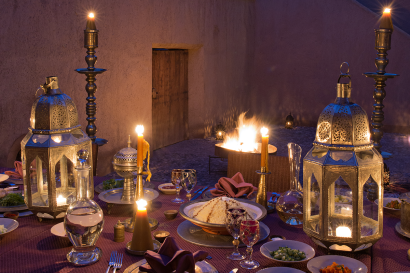 Dozens of places for organising meals inside the Kasbah or in the gardens. No other clients at the same time at the same place which makes it perfect not only for honeymoon couples, but also for families with kids or for groups of friends celebrating a birthday. Same thing with the activities and excursions. 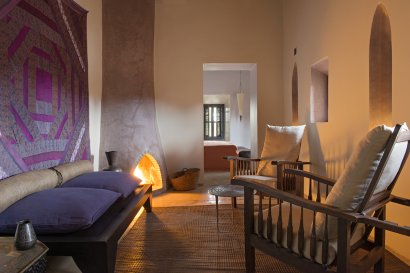 The property is located at the gateway to the Southern Moroccan desert, 40km east of Ouarzazate, in a palm grove named Skoura. It can be reached by plane (Ouarzazate airport) or by road. 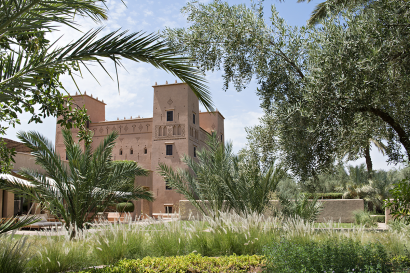 Dar Ahlam is located in a charming traditional palm grove and the main building is a Kasbah surrounded by a Garden of Eden, for a total surface of 2 hec. Skoura is among the few last palm groves in Morocco where people are still living there and growing grains, vegetables, fruits and olives. It is a very interesting village to visit: olive, potters and iron workers. The discovery of Skoura is part of the proposed activities. Located in the 1001 kasbahs valley, Dar Ahlam is not far from the Valley of Roses, Valley of Almond trees, the Valley of Draa, Gorges of Dadès… They are all gorgeous landscapes of palm groves, mountains, desert of stone. And they are all the greatest places for walking, trekking, riding a mule or a camel and horse-riding as well. • A menu to choose the wood to be in your fireplace so the fire will have the scent you prefer. • An aperitif in our large living room every evening, where all the clients can come and meet the other guests. • Linen and towels are different in each room. • An outdoor massage room in the summer. As we organise privately meals, activities and excursions, kids are welcome. We can organise mule ride while their parents are walking aside. We can organise cooking demonstrations. We propose free baby-sitting when their parents are at Dar Ahlam, taking a dinner for instance. 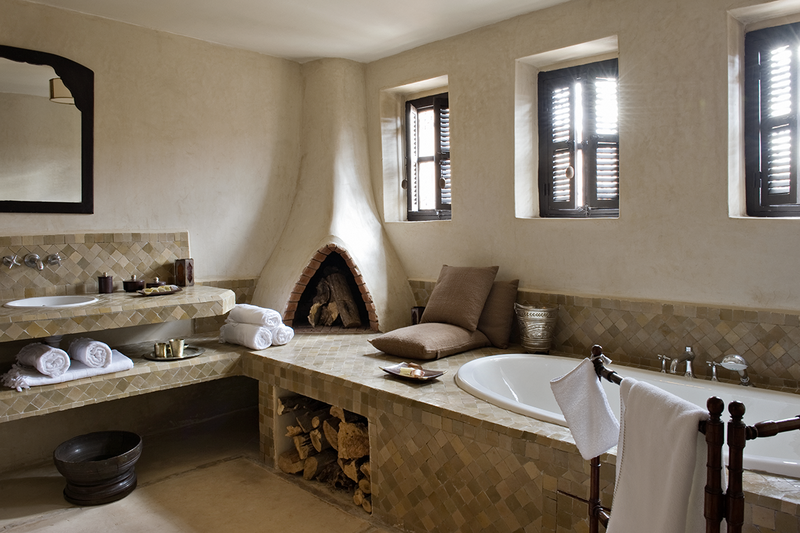 • 9 junior suites, surface of 35/40m² each, they all have heating, air-conditioning, a fireplace. Each one is decorated differently from the other one. 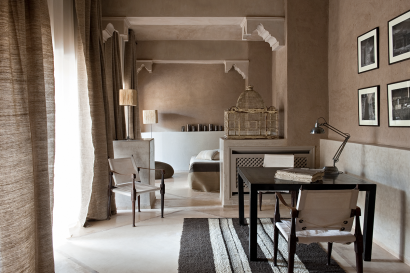 • 4 superior suites: surface of 80m² with heating and air conditioning. They are communicating (2 by 2) via their private terrace. Each has its one style and décor. 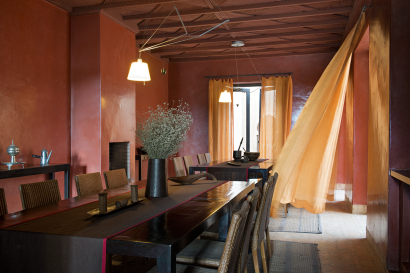 Number of Luxury rooms: 1 villa of 150m2, built around a patio. 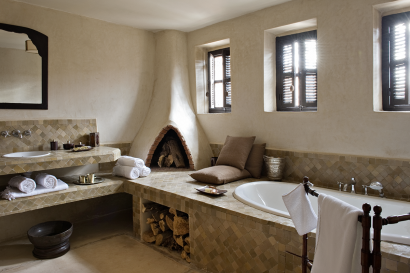 The villa has heating, air-conditioning, a main bedroom with a fireplace, one bathroom with shower and bathtub, a second smaller bathroom with a shower, a living-room with a fireplace. It has an exclusive terrace with a plunge pool. 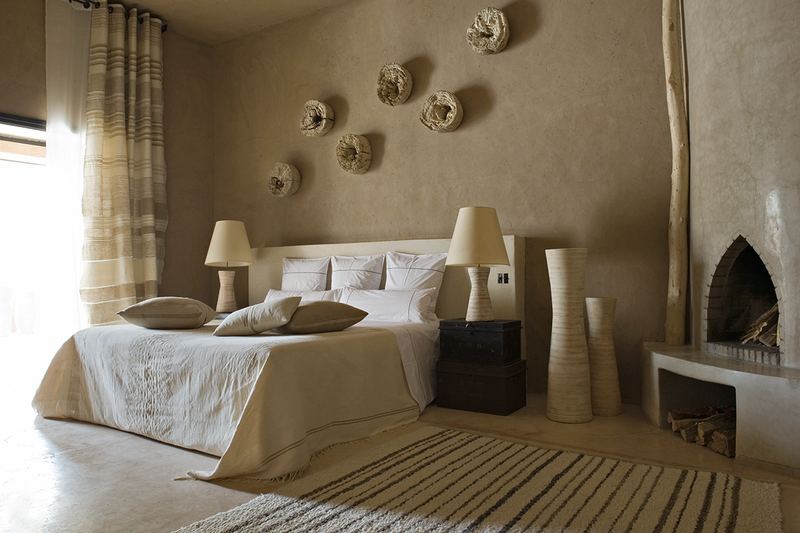 It is possible to create a second bedroom in a part of the living-room. No TV, no telephone, nor minibar. An excellent mobile phone network. A computer with an internet access is available in the library. Free wifi available in the junior suites located in the Kasbah, in the superior suites, the villa and in the main salon. 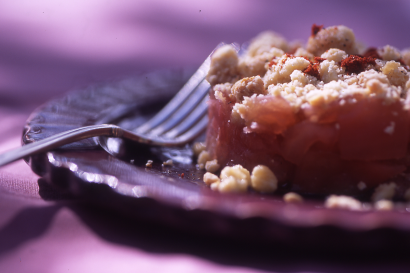 A gourmet experience through the large number of recipes created by Frederick Grasser-Hermé and desserts dreamed up by the famous French patissier Pierre Hermé. A delicate menu, combining the latest culinary innovations with traditional Moroccan recipes, to discover according to your tastes and wishes. Fullboard all year round except during low season when we propose also a BB and HB plans. • Outside heated swimming pool of 25m long. We organise on a regular basis seminars and weddings. At Dar Ahlam we can have a maximum of 30 guests in double occupancy but we can easily organise wedding dinners or special events for up to 50 people. For seminars, we can transform all our living-rooms, dining rooms in different meeting rooms. Cooking demonstrations by our Chef, Camel ride, mule ride, horse-riding for experienced riders, with extra charge : buggy, quad bike. In January, Dar Ahlam was ranked n°25 among the 100 best hotels in the world by Condé Nast Traveler USA in its Gold List.